At OKOKO Cosmétiques, ingredients matter. We truly believe that your precious skin deserves only the finest and purest skin care. Each ingredient is meticulously selected and researched to improve your skin for the better. 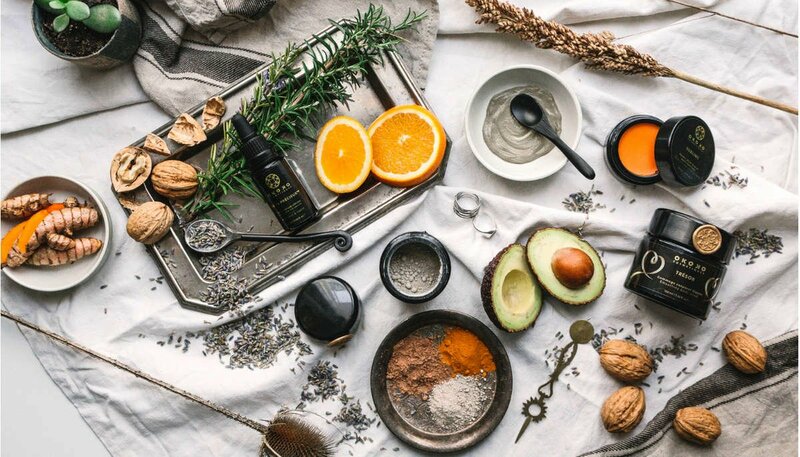 Our skincare line is made of ingredients such as Canadian glacial clay, moringa extract, spirulina extract, pomegranate extract, bakuchiol, calendula co2, dragon’s blood resin and willow bark extract, all carefully sourced locally and abroad from our trusted suppliers that do not conduct animal testing. Our oils and botanical plants are grown with integrity and care, and are purchased from some of the finest suppliers around the world. We always request the MSDS, Certificate Of Analysis and other certification documents from all of our suppliers. Each batch is comprehensively checked and tested by our team to ensure the highest quality and bioavailability to empower your skin. Our skin treats are packed with high levels of potent botanical actives and cutting-edge natural ingredients that are proven to perform. Burdock, licorice, bearberry, willow bark and calendula co2 are some of our favorite botanical ingredients. Our products feature a truly dazzling array of proven, high-performance natural active ingredients to amplify results. Discover some of our favourite ingredients below. Bakuchiol is used in skincare as a gentler alternative for retinol. Research has shown that retinol can tackle a tonne of dermatological concerns, including acne, wrinkles, and rough or discolored skin. It is known to be especially effective for anti-aging, acne, and exfoliation. The problem:is that there can be side effects, including sun sensitivity, extreme dryness, redness and irritation, as well as thinning of the skin over time. Sensitive skins have long been hesitant to use retinol. We are excited to offer you a natural alternative that truly works! BakuchiolProvides similar benefit without the side effects. Also, research has shown its ability to boost the efficacy of retinol serums. The best of both worlds. Bakuchiol is 100% natural and extracted and purified from Babchi seeds, which is used in traditional Indian Ayurvedic medicine. Dragon's Blood extract (Croton lechleri)is sustainably harvested from the Dragon's Blood tree as a red resin. The sap is rich in protective antioxidant phenols, and anti-inflammatories that stimulate skin repair to further reduce scars and imperfections. Dragon’s blood contains taspine, a known tissue-healing agent which has a remarkable effect on skin healing. Discover Dragon's Blood on our blog here. White Lupin extractIs a patented active ingredient derived from white Lupin seeds, rich in Lupeol, active molecule that increases the synthesis of Collagen I. It is an anti-aging and firming active ingredient (sourced from lupine plants cultivated using sustainable agricultural practices in France) that stimulates collagen production helping to increase skin firmness and elasticity, reduce sagging skin and remodel the facial contour and eye contour. Read more about this ingredient here. Moringa extract: Moringa is a potent antioxidant that helps fight free radicals. it helps to support skin's ability to manage oxidative stress which accelerates aging. Fermented willow bark This natural active ingredient offers increased skin hydration and de­livers an all-inclusive cosmetic product for optimal face care. It has potent, anti-inflammatory effect that makes it an effective ingredient to reduce inflammation and increase hydration. revitalize, bringing a new, glowing radiance to your skin. What find out what's special about this rare and precious ingredient here. Pomegranate sterolsprovides hydration, skin protection, anti-aging properties. Calendula co2is a potent extract that has a dark green/brownish colour and is especially loaded with antioxidants. It is well known for its healing, soothing and anti-inflammatory and anti-aging properties. Perfect for sensitive skin. It has demonstrated amazing skin benefits at very low dosage. Niacinamidecan improve skin’s look and feel, brighten dark spots/skin tone and revive skin's healthy texture. 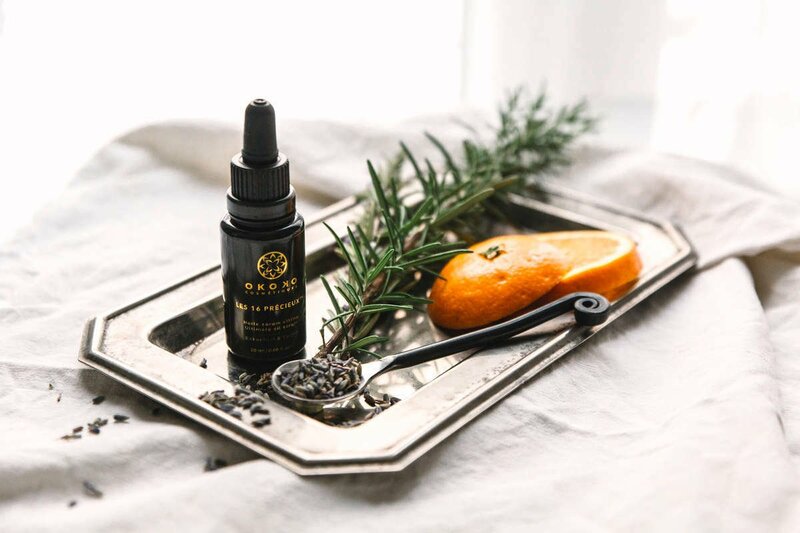 In our Dragon's Blood serum, we use 10% niacinamide to provide an effective skin-restoring solution that offers multiple benefits for aging skin, acne and with consistent use helping to fade the appearance of dark spots. Venuceane™ is an active anti-aging ingredient that offers not only UV protection, but is also highly efficient against Infrared (IR)-Ageing. This anti-ageing active meets expectations for a new generation of photo-protection based on UV and IR protection. It is by far the most complete active ingredient to fight effectively against photo-ageing - Sederma . Read more about Venuceane on our blog. Lycopene bioferment (water soluble)Lycopene is a type of carotenoid and a major pigment in tomatoes. It is a strong anti-oxidant that scavenges free radicals in our bodies, hair, and skin. According to a study (1): "Topical application of lycopene is a convenient way to restore antioxidants depleted from the skin by UV radiation and achieve protection against premature aging and cancer." Tomato oilis an antioxidant-rich active that serves to protect and repair the skin from damage and stresses caused by environmental pollutants and it has significant anti-aging properties. Cucumber extract provides a moisturizing, soothing feel on the skin. It is rich in nutrients and silica to improve the complexion and health of the skin, and is naturally hydrating, a must for glowing skin. Pomegranate enzymespromote gentle exfoliation of the skin, without irritation. They also promote natural skin renewal. Activated Bamboo charcoal is a powerful purifying and detoxifying ingredient. It helps remove toxins, impurities, and other harmful substances from your skin, revealing a clearer, revitalized and healthier looking complexion. It is also beneficial for acne-prone skin. Spirulina and Chlorella are antioxidants and mineral rich algae with soothing and detoxifying properties. glowing and radiant looking skin. Carrot resin is one of the most rejuvenating and regenerating oils that can be used in skincare. It is rich in beta-carotene as well as vitamins B, C, D and E. It helps improves complexion and is extremely effective for dry and aging skin. Blue tansy is powered by azulene, a powerful anti-inflammatory, calming and antibacterial gent. Morocco used in high-end spa for rejuvenating skin treatments. It gently cleanses, refreshes and improves the texture of the skin. large quantities of vitamins, minerals, and hyaluronic acid (which is a remarkable skin moisturizer). Willow Bark extractDue to its anti-inflammatory properties, is beneficial for oily and acne-prone skin types. (1) Nutrition & Cancer. 2003, Vol. 47 Issue 2, p181-187. 7p.